The Scent of Secrets by Jane Thynne is a historical mystery set in 1938 Germany as the world waits to see if Hitler will invade the Sudetenland. Ada Freitag is a passenger on a luxury cruise ship sponsored by the National Socialist Strength Through Joy movement. These cruises are now the only way ordinary German citizens can leave the country. Although the trip is supposed to be a treat for its travelers, Ada finds the strictly regulated schedule and activities too regimented for enjoyment. But she is on this trip with a specific and covert purpose. Bored, she strikes up a friendship with fifteen-year-old Erich, before disappearing from the ship. Cut to Paris and actress Clara Vine. Daughter of a Nazi-supporting British aristocrat and a German mother, Clara is a rising star in the German film industry. As war looms and conditions deteriorate in Germany, Clara turns down a marriage proposal to work as an agent for British Intelligence. She has the perfect personality for a spy and as an actress has the skills to wear a mask when needed. Her career gives her unprecedented access to the upper echelons of Nazi society — especially to the gossipy and loose-lipped wives of the Third Reich’s most elite officers. It is Clara’s last day in the City of Lights. The filming of her latest role is finished and she is anxious to explore Paris on her own. Before leaving her hotel room, however, she receives an invitation to meet with a representative of London Films at a local cafe. Clara is instructed to become friends with Hitler’s rarely seen girlfriend, Eva Braun. She is to pinch Eva’s diary and turn it over to British Intelligence. Because Eva is an ardent film buff and admires Clara’s work, a mutual acquaintance introduces the two. Soon Clara and Eva have a quietly forming friendship. Eva shares her passion for creating perfumes with Clara, designing an original scent for the actress. It is an on-going balancing act for Clara; spending time with Eva, her godson Erich, Nazi officers and their wives, persistent suitors and acting obligations. The tension she feels is palpable. Yet Clara proves resourceful time and again. Jane Thynne’s The Scent of Secrets is actually the third book in a series featuring Clara Vine. The U.S. publisher released this novel first in the States. I have not read the previous two novels in the set, which have been printed in the United Kingdom. It is my feeling that the back story would have been strengthened by releasing the books in order, but The Scent of Secrets can be read on its own. The background information in the first two books would probably convince me more of Clara’s motivation to serve the British intelligence community and to remain in Germany in spite of her perilous position. Thynne develops several plots within the story that recreate the atmosphere of fear and confusion the German population must have felt without being sentimental or sappy. The insight she shares into typical and not-so-typical German lives is thought-provoking and interesting. The author uncovers the hardships of Nazi Germany and exposes some of the ridiculous and restrictive rules, as well as the harsh treatment of those who do not fit the Aryan ideal. Even the perks and punishments of the Nazi elite are revealed. The Scent of Secrets by Jane Thynne can be read as a stand-alone novel. The book would have been enhanced by the release of the first two novels in the series, but on its own, The Scent of Secrets is captivating, and the ending will leave the reader begging for more of Clara Vine. Thank you to NetGalley and Ballantine Books for an advance copy of this novel in exchange for an honest review. All opinions are my own. I am a big fan of World War II literature, both fiction and non-fiction. 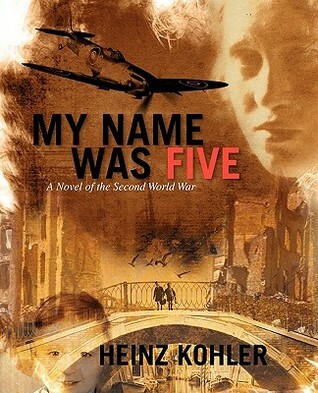 “My Name Was Five: A Novel of the Second World War” by Heinz Kohler is an excellent example of the blending of fact and fiction about the Second World War as viewed from the perspective of a young boy (Hans) who was born at the time that Hitler came into power. Hans, his mother and his younger brother Helmut spend most of the war living in Berlin. His father is in a concentration camp for being a political enemy of the Nazi regime, but is released when it becomes apparent that more men are needed to keep the German war machine in action. An exceptionally bright boy, Hans is intellectually encouraged from a very young age by his mother, father and Aunt Martel. Naturally curious, he asks dangerous questions about Nazi policies and eavesdrops on conversations that are not meant for little boys. However, it is obvious that his parents, their friends and some of their family do not buy the Nazi rhetoric. They listen to illegal broadcasts from the BBC as often as possible. Hans collects handbills, posters, newspaper articles and propaganda about the war and Nazi policies. Throughout the book, much of this type of material is reproduced. When Hans first attends school, he and his classmates are assigned seats according to their academic abilities. Hans sits in seat five, near the top of his class, and is thereafter called “Five” and not Hans, until his classroom status moves up or down. Even at school, which is run along party lines, Hans asks intelligent, controversial questions and writes thoughtful essays that often perplex and infuriate his teachers. His best friend, Dieter does not excel academically, but the boys are nearly inseparable. When disaster strikes Dieter, Hans’ life changes, and the episode haunts him for the rest of his life. Eventually Hans, Helmut and their mother leave Berlin to live in a village that is relatively safe from Allied attacks. However, in the village, as in Berlin, aunts and uncles who support the Nazis make life difficult for Hans’ family. When the Russians liberate his village, the town becomes part of East Germany and is under Communist control. These same family members jump ship and become supportive of the new government, while Hans and his parents continue to doubt and question the new regime. Under the Stalinist rule, Hans is one of the very few students selected to attend high school away from his home in the village, thanks to the pull of an uncle who has become mayor of the little town. Once Hans graduates from high school, his family makes a daring decision that saves them from a life of repression. But the wartime experience continues to cause trouble Hans for decades to come. Written from an unusual point of view, “My Name Was Five: A Novel of the Second World War” is fascinating in its details and insight into the life of Germans that were not supportive of Hitler’s policies, trying to survive first in a war-torn city that is the seat of power for the Nazi government, and later, in a village absorbed into a new country with a different, and equally repressive form of government. As the population of the WWII generation ages and passes on, it seems that more information is being revealed, shedding light on how average citizens were affected by this horrific time in history. Heinz Kohler writes an amazing account of a child’s exposure to war that should not be missed.